1951 Ringside Barney Ross. 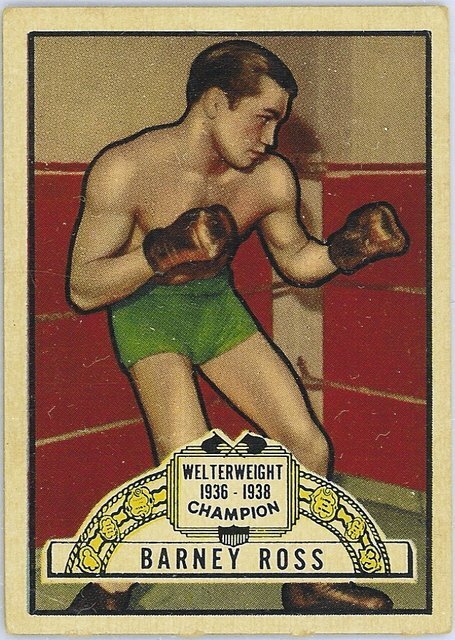 Card fronts show a color image of the boxer (a painted photo called a “Flexichrome” was used) with the name and division in a box. The illustration quality varies with the quality of the source materials. Champions of the past have gold laurels surrounding a plate with the title and dates of title above the name. The present-day champions have a crown on the card.